Protegés are paired with a mentor who gives them counseling and guidance. Anyone can be a protegé! Freshman and sophomores may be paired with a junior or senior mentor. Juniors or seniors considering graduate school may be a protegé to a graduate student or professional engineer. The mentor program includes many activities, including pumpkin carving, trivia, and Venture Out. For more information, contact Megan Schmidt (mmsny9@mail.mizzou.edu). Middle School Engineering ProjectOnce a month SWE sends several members to middle schools outside of Columbia to talk with students about engineering and do a fun project. The projects are generally on Tuesdays and Thursdays, in Boonville and Harrisburg (each is about 30 to 35 minutes away). For more information or to volunteer contact Director of Outreach Anna Rudy (amr6d5@mail.missouri.edu) or Outreach Co-Chairs Denise Dizon (dld6d9@mail.missouri.edu) or Tyler Frazier (tfc46@mail.missouri.edu). This fall, we will be making marshmallow catapults and more! Look for signups on OrgSync and at monthly meetings. One of the most important events in the College of Engineering is E-Week, which takes place the week of St. Patrick's Day. Various Mizzou engineering organizations are involved in the many events and activities of E-Week. One of SWE's contributions is the annual Green Tea. All MU students, staff and alumni are invited to a gathering with refreshments and a professional speaker. The Green Tea is a great opportunity to mingle with other female engineering students. Dress is business/business casual. For more information contact Suzy Shands (ssy83@mail.mizzou.edu). The 2012 SWE Green Tea will occur on St. Patrick's Day (Saturday) March 17. 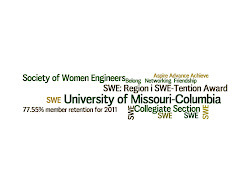 Girl Scout DayEach year, usually in February, SWE invites Girl Scout troops to learn about engineering at Mizzou. The girls participate in fun projects geared toward different engineering disciplines. It's a great opportunity to show girls that engineering is a lot of fun! For more information, contact Director of Outreach Anna Rudy (amr6d5@mail.missouri.edu) or Outreach Co-Chairs Denise Dizon (dld6d9@mail.missouri.edu) or Tyler Frazier (tfc46@mail.missouri.edu). The 2012 Girl Scout Day will be Saturday, February 11 from 9am to 4pm. Ten (10) volunteers are needed for each of two shifts (9am-noon and 1pm-4pm). Sign up to help out at: http://www.signupgenius.com/go/10C094AABA923A64-girl! !